"Tablah" redirects here. For the instrument used in Hindustani classical music, see Tabla. 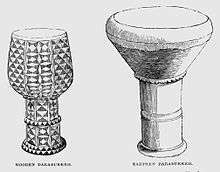 The goblet drum (also chalice drum, tarabuka, tarabaki, darbuka, debuka, doumbek, dumbec, dumbeg, dumbelek, tablah, toumperleki or zerbaghali, Arabic: دربوكة‎‎ / ALA-LC: darbūkah; Hebrew: דַּרְבּוּקָה‎, darbuqah) is a single head membranophone with a goblet shaped body used mostly in the Middle East, North Africa, South Asia, and Eastern Europe. The African djembe-wassolou is also a goblet membranophone. This article focuses on the Eastern and North-African goblet drum. The origin of the term darabukka probably lies in the Arabic word "darab" ("to strike"). The original use of goblet drums in Babylonia and Sumer dates from as early as 1100 BCE. On Celebes one large form serves as a temple instrument, set on the floor when performed, which could be a survival of the ancient use of the drum. The Eastern and North-African goblet drums are played under the arm or resting on the player's leg, with a much lighter touch and quite different strokes (sometimes including rolls or quick rhythms articulated with the fingertips) to hand drums such as the djembe, found in West Africa. There are two main types of goblet drums. The Egyptian style has rounded edges around the head, whereas the Turkish style exposes the edge of the head. The exposed edge allows closer access to the head so finger-snapping techniques can be done, but the hard edge discourages the rapid rolls possible with the Egyptian style. The goblet drum may be played while held under one arm (usually the non-dominant arm) or by placing it sideways upon the lap (with the head towards the player's knees) while seated. Some drums are also made with strap mounts so the drum may be slung over the shoulder, to facilitate playing while standing or dancing. It produces a resonant, low-sustain sound while played lightly with the fingertips and palm. Some players move their fists in and out of the bell to alter the tone. 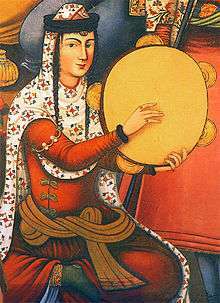 There are a variety of rhythms (see dumbek rhythms) that form the basis of the folkloric and modern music and dance styles of the Middle East. There are three main sounds produced by the goblet drum. The first is called the "doum". It is the deeper bass sound produced by striking the head near the center with the length of the fingers and palm and taking off the hand for an open sound. The second is called the "tek" and is the higher-pitched sound produced by hitting near the edge of the head with the fingertips. A 'tek' struck with the secondary hand is also known as a "ka". The third is the closed sound 'pa', resting rapidly the hand on the head to not permit an open sound. Additionally, there are more complex techniques including snaps, slaps, pops and rolls that are used to ornament the basic rhythm. Hand clapping and hitting the sides of the drum can be used in addition to drumhead sounds. Another technique commonly used in Greece, Bulgaria, Turkey and Egypt is to tap with the fingers of one hand and with a thin stick in the other. 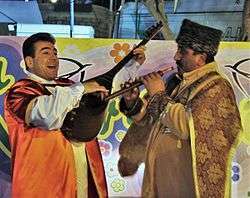 In Turkey the stick is called the çubuk, which means wand, or stick. The Romani of most of the countries associated with the goblet drum use this technique. The first known Western classical composition to feature a goblet drum is the opera Les Troyens (1856–1858) by the French composer Hector Berlioz, which calls for a tarbuka in the Dance of the Nubian Slaves in Act IV. The first compositions for goblet drum and orchestra were composed by Halim El-Dabh in the 1950s; his Fantasia-Tahmeel for goblet drum and strings was premiered in New York City in 1958, with a string orchestra conducted by Leopold Stokowski. TOYMBELEKI Museum of Popular Instruments, Research Centre for Ethnomusicology. In Plaka, Athens, Greece. 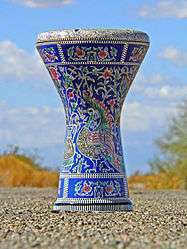 Wikimedia Commons has media related to Goblet drums, Tonbak, Darabouka, Djembe and Ashiko (drum). ↑ Silverman, Carol (2012). Romani Routes: Cultural Politics and Balkan Music in Diaspora. Oxford University Press. pp. 258, 393. ↑ Blades, James. (1970). Percussion Instruments and Their History. New York. p. 175. ↑ Garland Encyclopedia of World Music). Routledge; Har/Com edition (November 1999). ISBN 978-0-8240-4946-1. ↑ Sadie, Stanley, (1980). "Darabukka". The New Grove Dictionary of Music and Musicians. Vol. 5. p. 239. ISBN 1-56159-174-2.